B21 has received an email asking for support for the Friends of the Earth campaign to persuade the European Union to vote in tougher regulations on CO2 emissions from cars this coming October. Calm down Judith, I am going to try and draw together some of my own thinking and see where that leads. We have all heard about Climate Change, or is it Global Warming, greenhouse gases and specifically CO2 - the bogeyman of gases. 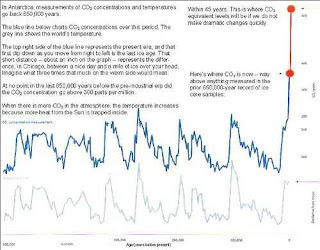 Al Gore used a similar graph showing a correlation between global temperature and CO2 concentrations in the atmosphere, going back 650,000 years but again this is disputed. So, then I’m reading a series of articles by Michael Blastland on the BBC magazine on the pitfalls of using statistics and this week it’s about causation. Did you know that when ice cream sales go up so do shark attacks? 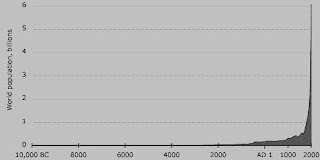 Anyway, I’m quite prepared to accept that CO2 concentrations in the atmosphere fluctuate and have done so for quite a long time. But why? Well, animals [and that includes human beings] breathe. We inhale air and extract oxygen and we exhale Carbon Di-Oxide – CO2. But plants use that CO2. They extract and store Carbon from the atmosphere thereby giving a higher concentration of Oxygen in the atmosphere for us animals to breathe. It’s called symbiosis. Animals [that's us, human beings, in case you've forgotten] and plants are mutually dependent. So, the fluctuations of CO2 in the atmosphere over the centuries COULD be a reflection of the BALANCE between animals and plants. A population explosion among animals, more CO2. More plants, less CO2. Of course there will be other random events that affect this like volcanic eruptions and major forest fires. There was no Fire Brigade 300,000 years ago. 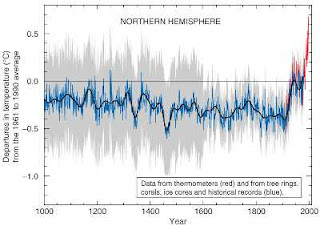 The fluctuations in temperature between Ice Ages and warm periods may well be related though. Cold periods appear to correspond to low CO2 levels when it is pretty difficult for most animals to survive, so I can imagine animal populations decreasing overall in cold snaps, but then so too would plants. Which brings me back to the present. The industrial revolution which started burning fossil fuels [which is releasing vast amounts of hitherto locked up carbon into the atmosphere] has also permitted a dramatic increase in human population and this graph is also a Hockey Stick and it also correlates to the recent rise in CO2 and global temperature. What we have not got is a popluation chart for animal life, which if we did would not surprise me if it correlated to the Al Gore chart above. The Climate Deniers, as I understand it, do not dispute that the climate is changing, they merely dispute that it is anthropogenic or man-made. What is worrying me is not so much the climate but that our planet’s life support system, the symbiosis, is changing and we don’t really know where that is going to lead. Irrespective of whether CO2 causes Global Warming, how much CO2 can the atmosphere handle before it impacts on the health and future wellbeing of animal and human life? Over on Schnews there is a report that there is no shortage of oil, or for that matter coal. We’ve got shed loads of it left and then there are the bitumen deposits – Venezuela is another Saudi Arabia on Bitumen alone and that’s without the oil they’ve got. The irony is that as we become more risk averse we are set to make the biggest gamble of all. What a load of cobblers! You sound like President Bush. I keep telling you it's all down to cow farts. "UN figures suggest that meat production puts more greenhouse gases into the atmosphere than transport." "People should consider eating less meat as a way of combating global warming, says the UN's top climate scientist." And yes, some reckon that Methane [cow farts] is a far more potent greenhouse gas than CO2. But you have not engaged with the basic premise above, that a shift in the content of our atmosphere towards CO2 will affect life [as we know it] on this planet. As everyone knows, 87.5749% of statistics are complete nonsense. There is nothing wrong with statistics, it's the interpretation that is usually complete nonsense. Has anybody thought about the side effects of 'hot air'? So much of it about! Yes, Anne, if only it was put to good use! OK, I fought against commenting, but I lost. I would not trust Friends of the Earth or Greenpeace if they told me the sky was blue or the sun rose in the east. In order to earn their crust, (and their State subsidies) they have to constantly ratchet up their doom-mongering - heavily backed up by that fool Hansen (not to mention Al Gore). Could we just learn not to run around like headless chickens, enjoying the adrenaline rush of believing every shred of prophecies that the End Of The World Is Nigh? Could we start looking at the motivation behind many of the Jeremiahs, and stop our naive belief in tabloid headlines? Could we, in other words, start being sensible? I thought I was being being rather sensible? I pointed out where things are disputed [with links] and gave my own thoughts on the subject. It may be Bx but it is there to be challenged. I am not afraid to change my mind. The purpose of this site is to inform, challenge, and encourage readers to think for themselves. We are also open to guest posts. Aaaargh, I wasn't criticising you, dear Editor, but the whole new religion of AGW. Thanks Judith, twice. I have recently seen references to AGW without any contextual information and was wondering what it meant. Now I know. Oh dearie dearie me: I must admit to being thick again: AGW? I looked at google: nothing! Anyway, he was playing it so safe. He howled: There will be heatwaves, there will cold snaps, there will be droughts, there will be floods. There will be hot summers, and there will be cold summers. Absolutely brilliant: all bets edged. No escape. And, as we all breathe, we produce CO2! Judith, I like it when you use blue and rose. Music to French ears! In this instance AGW = Anthropogenic Global Warming. It seems that, whether I like it or not, I am part of AGW! I will be on Judith's side though: I am still not hundred per cent convinced that GW is entirely man-made, which does not mean I don't think we should exhaust the earth resources as if there was no tomorrow. We'll know when they get serious with the "Large Hardon Collider". Excusez-moi, M'sieu B21, was that a deliberate or Freudian error in your typing of Large Hadron Collider? B21 - anyone considered that it may be the underground testing of munitions which has actually shoved Mother Earth from her cosy fireside axis? This period of changing climate (choosing words carefully here OK!) is much too involved technically to summarize any small part of the study as the cause! Re the graph shooting through the A4 sized graph paper edge. Let us consider, if we have about five years to spare for intensive research, why do these Prophets for the Global-Warming fashion, not differentiate between fossil diagnosis and modern hyper-accurate technology? Does no one remember the BIG HEATWAVE of the 70's or the BIG FREEZE of the late 40's (1970's 1940's)? And has anyone - who installed a sundial in the past thirty or so years not noticed that the relative time has shifted, which suggests - perhaps - that the axis of Mother Earth may be coming home from the pub - so to speak! Do you like the way I have shifted from " " to - - and do you agree with the idea that more info and study is needed on this phenomena and safeguards need to be in place to ensure that the funding source does not bias the results that are published etc. PS the allotment thingy in Redbridge urmmm is hotting up by the way. Ain't unblinkered debate wonderful -? PS the above is 224 words – 2 + 2 + 4 = 8 – Now that is said to be lucky in the Orient. Apparently the Earth's axis does have a built in wobble [or precession] with a period of every 26,000 years or so. It makes me giddy so I compensate by drinking vast amounts of beer.